Dr. Lorenz was raised in Palos Verdes, CA. She earned her Bachelor of Science degree in Biochemistry from U.C. San Diego and her dental degree from the UCSF School of Dentistry. When not chauffeuring her two teenage children, she enjoys reading, tennis, swimming and creating art. 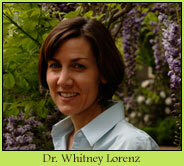 Dr. Lorenz volunteers at various non-profit dental clinics and events, including CDA Cares. She is fluent in Spanish.